Residents met in the Town Hall on Thursday evening to discuss the preservation of Louth's threatened Post Offices. At stake are the futures of Brackenborough Road Post Office and Newmarket Post Office, earmarked for closure along with 2500 other Post Offices nationwide. ELDC district councillor Lesley Koumi chaired the meeting. Representatives from Post Office Ltd were noted for their absence. Councillor Koumi mentioned that they had been invited to the meeting, but she was informed that "all the managers from Post Office Ltd are busy tonight". Nigel Howells outlined ELDC's position on this, saying "We are fundamentally opposed to the closure, which has no rational basis." The ELDC Chief Executive pointed out the importance of accessibility and the way that Post Offices can also act as community centres. Duncan Nicholson of PostWatch, a national watchdog for postal services, spoke next. He explained a few things about PostWatch's role and position. "PostWatch does not have a blanket opposition to the closures," he said. "We recognise that a business losing �4 million a week cannot go on like that." Mr Nicholson went on to explain that PostWatch does not have the power to veto any closures, but they have to be listened to. It is their job to scrutinise the plans and help to determine which closures would be the "least worst option." 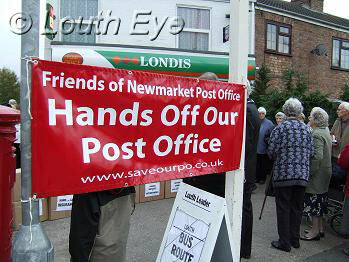 According to Alex McMullen, of the Friends of Newmarket Post Office, both of the Louth Post Offices threatened with closure are very popular and well used. 40% of Newmarket's regular customers are OAPs. 200 people turned up to the recent candlelit vigil to protest the closure; many of these people were OAPs. Many of Newmarket's customers have expressed anger and disbelief about the proposed closures. Post Office Ltd claims that the journey to the nearest Post Office is on level terrain and only 0.6 miles, but this is incorrect. Post Office Ltd claims that there is a frequent bus service. However this only goes part of the way. "I really believe we can win the fight to save both these Post Offices," Mr McMullen said. A member of the public brought up the issue of Louth's population. "We will end up with one Post Office serving a town of fifteen thousand. 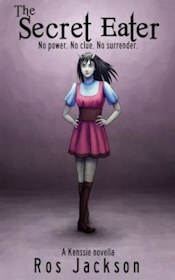 That, in my view, is absolutely ridiculous," he said. Nigel Howells concurred: "It is quite bizarre to expect one Post Office to serve fifteen thousand people." He also expressed concerns that the villages that Louth serves could also lose their Post Offices. Louth resident Audrey Gardner raised the issue of the practical problems people may face, both young and old. "We need these facilities," she said. "Let us fight, fight, fight for what is rightfully ours." John from Langworth, where there is also an ongoing campaign against Post Office closures, warned "If we're not careful we're going to be fighting community against community. We need to take our fight to London. Let's get the 2500 changed." This is in reference to the figure of 2500 Post Offices that the government has announced must be axed nationwide. "The PostWatch is useless," commented Colin Bell of Yarburgh. "It has accepted there is an economic argument. I don't believe there is an economic argument. There is a green issue." Mr Bell explained further that the Post Office closures will mean people will need to use extra petrol to visit the next nearest one. "Are you aware that at least 300 dwellings are going to be erected within about 200 yards of Brackenborough Road Post Office?" asked Councillor Clive Finch. "The importance of maintaining the two sub-post offices is increasing." Nigel Howells was critical of Post Office Ltd's divisive tactics and the way they are implying that if one Post Office is saved another must be lost, describing it as "quite a fraudulent way to consult the local population". "Bombard your MPs with letters," he advised. Brian Shaw had some practical help on that front, bringing 200 pre-written letters of protest with him so that people just need to fill in their name and address. "People don't write letters," he said.